PITTSBURGH, PA – DiCicco Development Inc today announced that its newly constructed Parkwest Corporate Center in Findlay Township, Pa., has won an award from the National Association of Industrial and Office Properties (NAIOP). 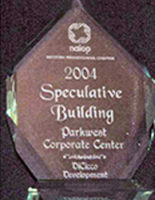 The four-story, 104,000 square-foot building was recognized as the Best Speculative Building constructed in 2005. DiCicco Development accepted the award at the NAIOP Annual meeting at the Pittsburgh Convention Center. DiCicco was responsible for the development and construction of this project. LanXess, an internationally active chemical company, is the sole tenant. The development’s location in Findlay Township’s RIDC West Office Park is just off of the Montour Run Road exit of Route 60 east or west. This allows Parkwest’s Tenants to be at the Pittsburgh International Airport in ten minutes, Downtown Pittsburgh in twenty minutes, or to Route 79 north or south in ten minutes. DiCicco Development, Inc, Moon Township, Pa., has been in business for over 30 years. DiCicco prides itself on attention to detail and functionality in their projects, which has led to success recognized with Multiple awards from organizations such as NAIOP and the Master Builders Association. PITTSBURGH, PA – DiCicco Development LLC today announced that its newly constructed Westpointe Corporate Center Two in Moon Township, Pa., has won an award from the National Association of Industrial and Office Properties (NAIOP). 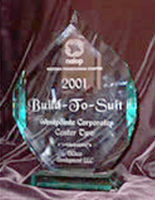 The five-story, 150,000 square-foot building was recognized as the Best Build-to-Suit structure constructed in 2001. DiCicco Development accepted the award at the NAIOP Annual meeting last night at the Pittsburgh Hilton and Towers, Pittsburgh, Pa. DiCicco was responsible for the development and construction of this project. NOVA Chemicals’ USOC provides office space for over 400 employees, including the Canadian-headquartered company’s top management. Other company departments working in the new building include sales and marketing, customer service, legal, financial, information technology, purchasing, human resources, investor relations, public affairs, manufacturing management, and logistics. In 1998, NOVA Chemicals moved its executive leadership from Calgary, Alberta to Pittsburgh in order to be closer to its customers, employees and investors. “A one-hour and 30-minute flight in any direction from Pittsburgh enables us to reach 95 percent of our investors and 60 percent of our customers and employees,” said Lipton. DiCicco Development & Contracting, Moon Township, Pa., has been in business for over 30 years. DiCicco prides itself on attention to detail and functionality in their projects, which has led to success recognized with the NAIOP Speculative Building of the Year Award and the Master Builder’s Award for Excellence in Craftsmanship. PITTSBURGH, PA – DiCicco Development LLC today announced that its newly constructed Westpointe Corporate Center One in Moon Township, Pa., has won an award from the National Association of Industrial and Office Properties (NAIOP). 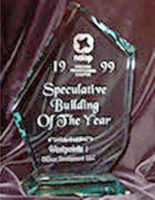 The five-story, 125,000 square-foot building was recognized as the Best Speculative Building constructed in 1999. DiCicco Development accepted the award at the NAIOP Annual meeting at the Pittsburgh Hilton. DiCicco was responsible for the development and construction of this project. The development’s location in Moon Township is located on the newly configured Coraopolis Heights Road, which gives the Westpointe Tenants immediate access to Route 60 east or west. This allows Westpointe’s Tenants to be at the Pittsburgh International Airport in ten minutes, Downtown Pittsburgh in twenty minutes, or to Route 79 north or south in ten minutes. DiCicco Development & Contracting, Moon Township, Pa., has been in business for over 30 years. DiCicco prides itself on attention to detail and functionality in their projects, which has led to success recognized with the Master Builder’s Award for Excellence in Craftsmanship. The Building Excellence Awards program honors outstanding project teams for facing significant construction challenges and managing them to successful completion. The church project was difficult because the work had to be done while the congregation continued holding services and offering day care, DiCicco said. 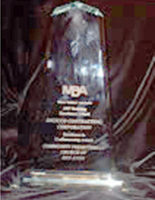 His company’s award was presented at the Master Builders Association’s annual dinner, held at Pittsburgh’s Duquesne club. Other structures DiCicco Contracting has worked on include Moon Township Public Library and Sto-Rox Elementary School, McKees Rocks. The firm is now working on modifications to Coraopolis Heights Road.